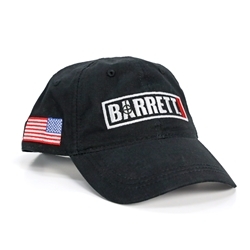 All black hat, with an embroidered Barrett logo on the front. U.S. flag on right side and the signature of Ronnie Barrett on the back. Velcro strap, one size fits most.